... Do kittens dream in primrose? ... Where did you put my khaki shorts? Many of Heather Reyes's short stories share a connection with paintings (and painting titles) by Paul Klee, Matisse and Kandinsky. Full of verve, wit and intimacy, her superbly quirky, mischievous and colour-filled stories show how our daily lives are richer, stranger and more dangerous than we know. Why is Genghis Khan on little Eva's bed? Who painted 'Only connect' on the Ritz? What does a gargoyle have to say about the world? Did Mr Davidsbundler really come to call? 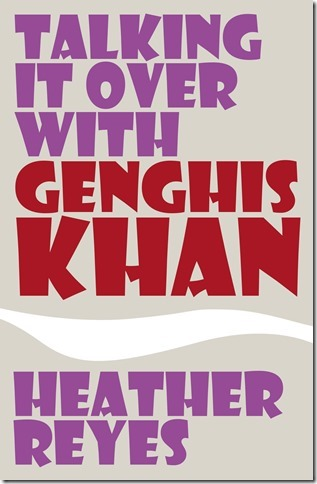 In the world of Heather Reyes's Talking it over with Genghis Khan the answers are as unexpected as the questions. Her short stories have appeared in many UK and US literary magazines including Fiction International, Ambit, Philosophy Now and Mslexia. Heather Reyes is the author of three novels - Zade, Miranda Road, and Perfectly Fine, along with two books on reading - An Everywhere: a little book about reading and Book-worms, Dog-ears, and Squashy Big Armchairs: a book-lover's alphabet. Heather Reyes is a writer and creator of the city-pick urban anthology series. She has published both fiction and non-fiction: Zade, Miranda Road, Perfectly Fine, An Everywhere: a little book about reading and Book-worms, Dog-ears, and Squashy Big Armchairs: A Book Lover's Alphabet. Her short stories have appeared in a wide range of publications in the UK and USA, along with articles on the work of avant-garde writer Christine Brooke-Rose, the subject of her PhD. She has worked as an English teacher and editor, and lives near London.